Investing worry into one's life yields no returns, and no one is better placed to teach readers this than Dale Carnegie, as he sets out to do in How To Stop Worrying and Start Living. 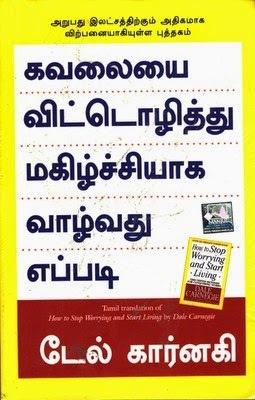 This edition is an expert translation into Tamil from the original. After battling with constant fear and worry himself, Dale Carnegie set out to write this book to show others how to battle self-doubt and to succeed no matter what the odds. Blending his natural storytelling skills with his teaching methods, Carnegie sets out to examine why human beings worry. He teaches readers how to analyse the causes behind worry and search for a solution without breaking down. He also discusses factors which one cannot control and needs to ignore. His book explores the themes of conquering worry and takes numerous examples from successful people who won in the face of seemingly overwhelming odds, beating the need to worry through persistence. Dale Breckenridge Carnegie was an American writer, self-improvement course developer and lecturer, corporate trainer and public speaker. He is best remembered for his books: How to Win Friends and Influence People and Lincoln the Unknown.